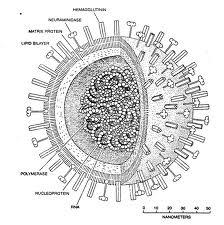 New Drug Targets Viral Infections- Hope for HIV? Most bacterial infections can be treated with antibiotics such as penicillin, discovered decades ago. However, such drugs are useless against viral infections, including influenza, the common cold, and deadly hemorrhagic fevers such as Ebola. Now, in a development that could transform how viral infections are treated, a team of researchers at MIT’s Lincoln Laboratory has designed a drug that can identify cells that have been infected by any type of virus, then kill those cells to terminate the infection. Viruses are notoriously difficult to treat- technically, they aren’t “alive” so there’s not an effectively good way to “kill” them. Killing the specific cells in which they reside seems like a good place to start- and also has implications for the treatment of cancer, HIV- any disease which starts with an infected or mutated cell. This entry was posted in Health and tagged avian, bird flu, breakthrough, cancer, cells, common cold, Ebola, flu, HIV, infection, influenza, research, Sars, Science Daily, treatment, virus.